Many people may wonder “how do I download music online to iPhone”. Actually, the methods are various. It is not so hard to download music online and listen offline on iPhone at all. If you are lucky to read the contents in this guidance, you will be clear on why I say so. 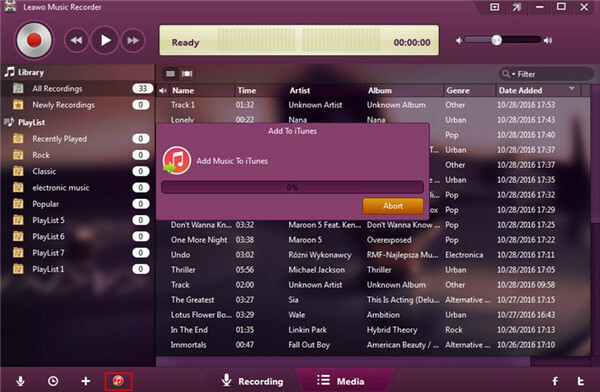 This tutorial will show you 3 great solutions to help you to download music online for iPhone. If you are a music lover, you may desire to know some great websites for you to enjoy songs in spare time. Before explaining the ways to download music online to iPhone, here I would like to recommend you 5 online music websites for reference. 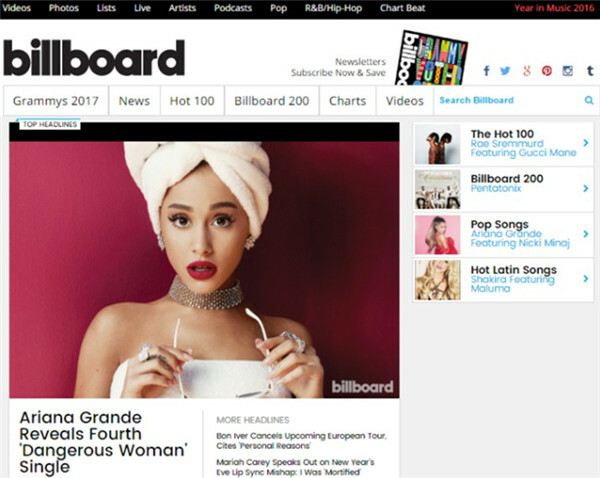 This website can offer you mainstream music and you can enjoy the Billboard 100 (singles) and the Billboard 200 (albums) as you like. 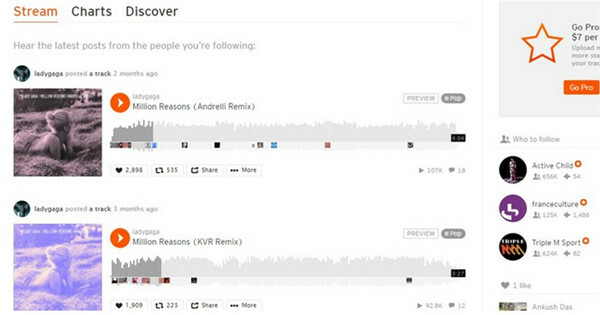 SoundCloud is known as one of the most loved music streaming services, which provides users with numerous original creations and interesting tunes. 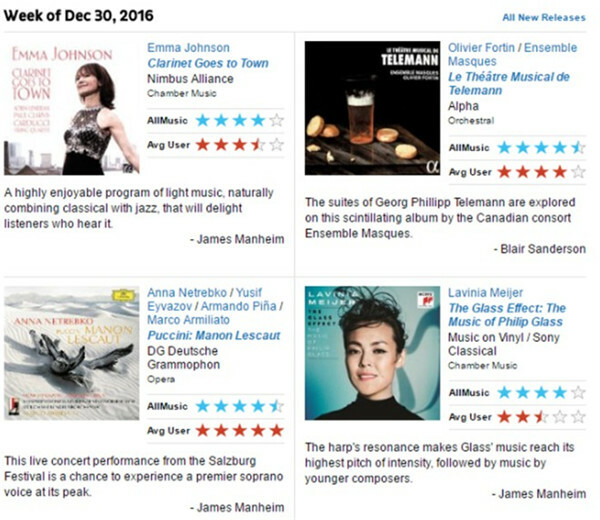 When you navigate to AllMusic, you can get songs from 3 difference areas, including “Featured New Releases,” “All New Releases,” and “Editor’s Choice”. The popular music on it will surely satisfy you. Pandora can be used to listen to your favorite music Internet radio station whenever you like. You can find lots of interesting Internet radio stations with this website. Jamendo is a famous music website, which is known as one open community of independent artists and music lovers. The music types on it are diverse and you can upload your own songs to it as well. Leawo Music Recorder is one good tool for you to download music free online to your phone. It is very convenient for you to use this software to record online audios to computer and the source quality can be retained 100%. This superb program is very easy to use, which allows you to record free songs from computer audio , built-in input audio and online music sources, like YouTube, Spotify, AOL Music, Last.fm, etc. and then save in MP3 or WAV format. After the recording, you just need to transfer to iPhone to finish this task. Now let’s begin to see how to make it in the following paragraphs. 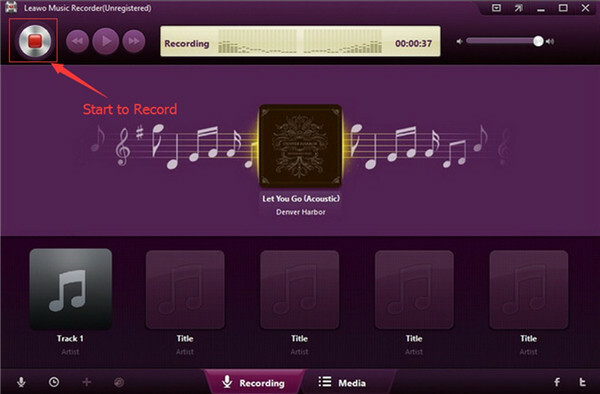 The steps shown above will direct you to use Leawo Music Recorder to record one of your favorite songs online. 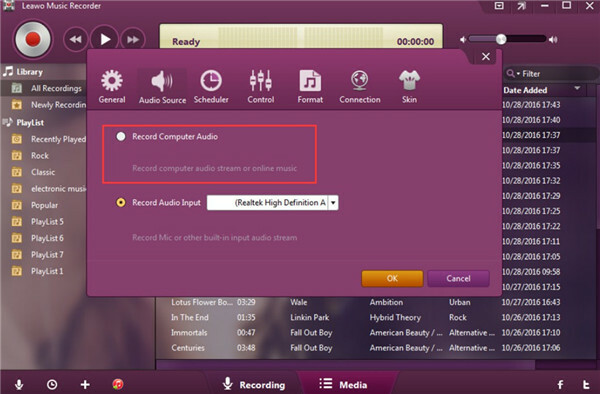 Launch Leawo Music Recorder on computer and then click on the microphone button at the bottom left corner of the window. Choose “Record Computer Audio”. Afterwards, you need to hit on the tab of “General” and then click on the folder icon to choose a folder on computer to save the recorded file. You can also set the language you need in this panel. 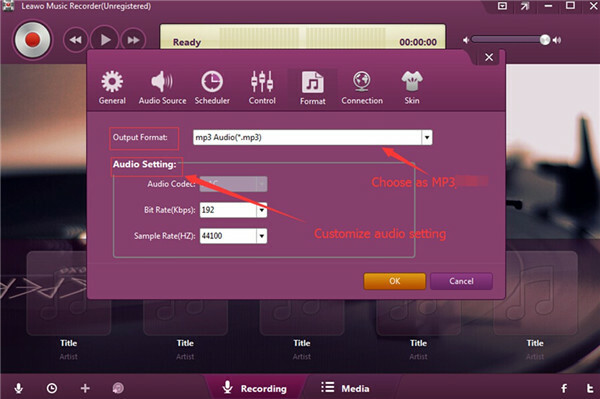 Click on “Format” tab and then choose “MP3” as the target format. In order to enhance the quality of the recorded file, you can change the parameters as you demand, such as the audio code, bit rate and sample rate. After that, click on “OK” button to save your settings. 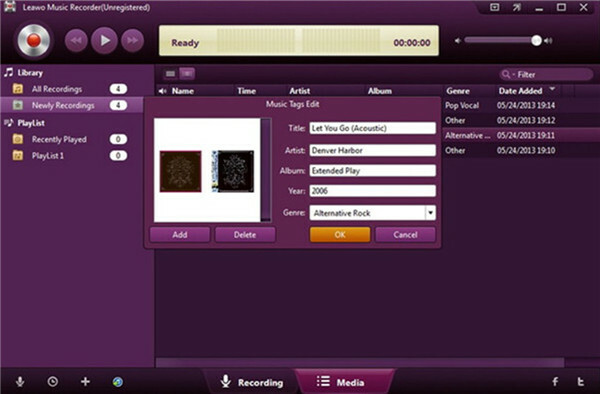 Go back to the main interface of the software and then click on the red recording button to initiate the procedure to record the music online. You need to go to the music website to play the song on your computer at the same time. When it comes to an end, click on the red button once again to finish the recording process. The software enables users to edit tags by themselves. If you have this need, you just need to click on the recorded music to invoke the editing menu to adjust the music tags as you like. In the end, you can hit “OK” button to complete the editing process. If you do not care about the tags, you can finish the recording work in Step 4 as well. After you have recorded the online music you are fond of, you can continue to add the recorded file to iPhone to address the problem of how to download music online and listen offline. This can be realized with or without iTunes. 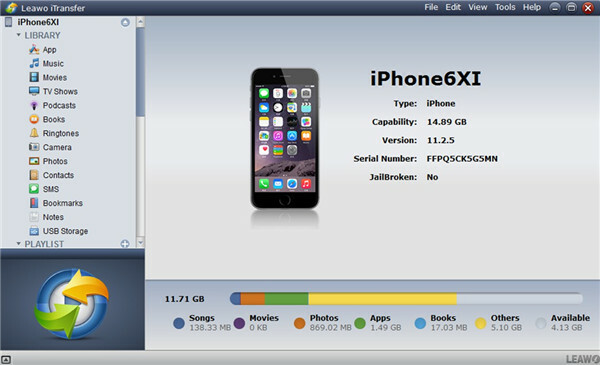 iTunes is a good backup tool, which can be used to transfer files between computer and iDevices as well. In order to finish the task to download music online for iPhone, you can make use of Leawo Music Recorder software to add to iTunes after the recording and then sync it from iTunes to iPhone. The detailed steps are illustrated below. a) After you finish recording the online songs you desire, you can choose the music files under the “Library” tab or click “Ctrl” key to choose multiple songs. b) After that, hit the red music icon of “Add to iTunes” that is circled in the photo below to add the recorded songs to the library of iTunes. a) Connect iPhone with computer via proper USB cable and then run the latest version of iTunes. Hit on the tab of “Edit > Preferences > Devices” in order and then choose the option of “Prevent iPods, iPhones, and iPads from syncing automatically” to tick. b) Hit the iPhone icon in the interface and then click on “Music” tab under “Settings > Summary” menu to tap on. c) In the right part of the window, choose “Sync Music” to click on. 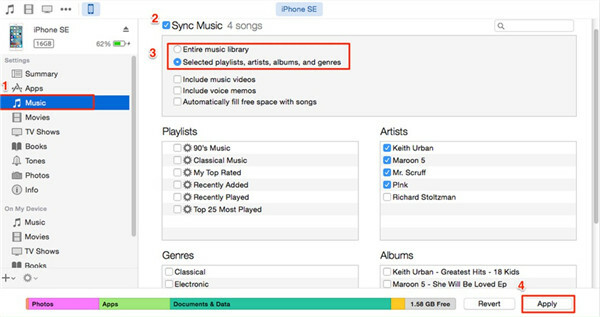 You can choose to sync the entire music library on iTunes or the selected ones as you like. d) Finally, you can click on the “Apply” button at the bottom right of the interface to start transferring recorded music from iTunes to iPhone. It is a bit complicated to transfer recorded online songs to iPhone via iTunes. Therefore, I’d like to recommend you take advantage of Leawo iTransfer to deal with the issue of how to download music free online to your phone much easier. Leawo iTransfer has won a good reputation among users all over the world. Its powerful functions in transfer are incomparable. It can cope with the transfer problems among iTunes, computer and iDevices with only a few clicks, and the process is quite time-saving. Now let’s begin to have a look at how to transfer recorded online music from computer to iPhone directly. Connect iPhone to computer via matched USB cable and then run Leawo iTransfer on computer. This software will recognize your iDevice automatically. Your iPhone info will be shown in the main interface clearly. Click on iPhone icon and then navigate to “LIBRARY > Music” tab to check all songs on iPhone. 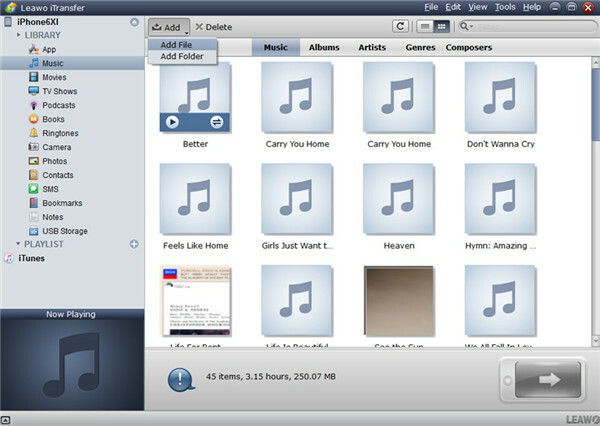 After that, you need to click on “Add > Add File” or “Add > Add Folder” button to browse your computer to find the recorded songs you have exported from Leawo Music Recorder. When you find the files, you need to click on “Open” button to initiate the importing process from computer to iPhone. When this procedure is over, the recorded online songs will be available on iPhone. You can also download music online iPhone via Apple Music app. This app allows users to get access to numerous songs free of ads. It can work with iTunes library seamlessly, which can give you a wonderful experience of enjoy music on iPhone. 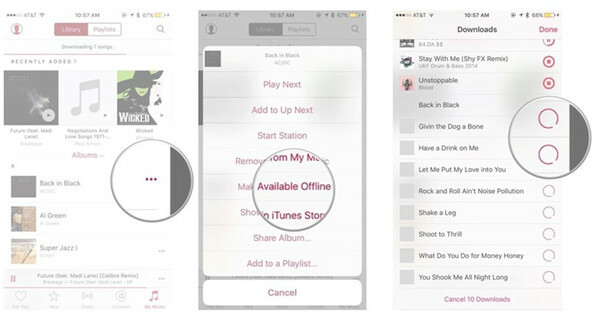 You can easily add a song, an album or a playlist to your iPhone local library for off listening. Here I would like to take one piece of music for instance. Let’s see how to make it come true. 1. Run Apple Music app on iPhone from home screen. 2. Navigate to the song or album you desire to download for offline listening. 3. Click on the button with three horizontal points to the right of the song and then click on “Make Available Offline”. The music will be downloaded to your iPhone right away and you can view the process by clicking on the download bar at the top of the interface. With the fast development of Internet, more and more music websites emerge, which makes the music downloading more convenient. However, there is a copyright risk by obtaining songs from these free music downloading websites and maybe you are unable to find most of the popular songs you desire to gain. If you still want to try this method, I would like to recommend you some reliable free music downloading websites for you to refer to, such as PureVolume, MP3Juices, Amazon Music, Mp3 Music Download Hunter, Spinrilla, My Mixtapez Music, Wynk Music, SoundClick and etc. Here I will take Spinrilla for example to show you to how to handle the issue of download music online for iPhone via free music websites on computer. 1. Open a web browser on computer and then navigate to the website of Spinrilla. 2. Sign up and then log into it with your own username and pass word. 3. Afterwards, you can choose a song that you desire to download and hit the download button at the right side of the music. In the pop-up panel, you can choose a folder to save the downloaded song for later use. 4. Finally, you can refer to the two steps in Part 2.2.2 to transfer the songs you have downloaded from the free music website to iPhone via Leawo iTransfer. In brief, Leawo Music Recorder is more powerful than Apple Music app or music websites to a great degree, which can benefit you a lot in obtaining various kinds of input audio, computer audio and online music sources. There is no hesitation for you to choose Leawo Music Recorder to assist you to download music online and listen offline.